' HP Day 11: Mischief Managed - Sisters, What! The little one is at the age where he wants to investigate everything BUT his own toys. Oh, and he is fast. It was only necessary for me to make him this onsie. After all, I'm positive that he is thinking mischief managed after he has finished scattering all the books and dvds off the shelf's. I used the font Parseltongue which you can download here. 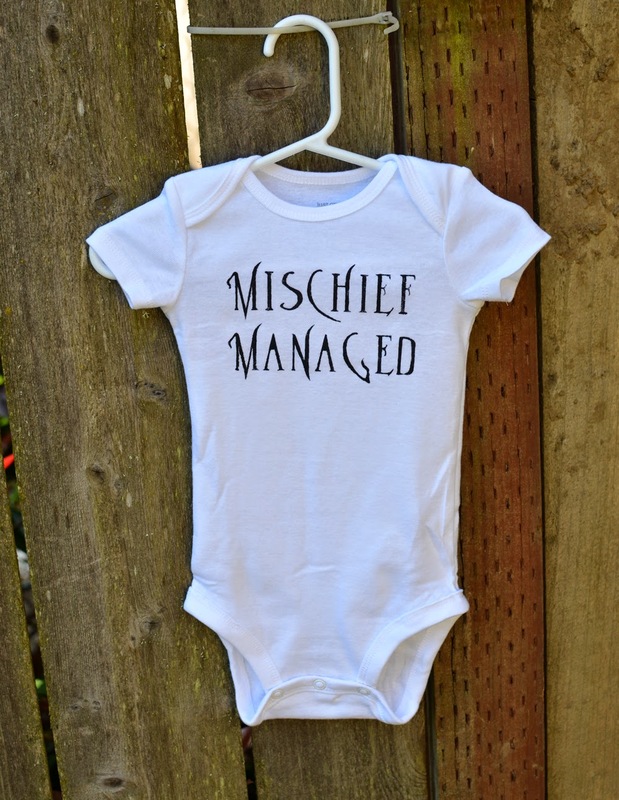 You can follow this freezer paper tutorial to make your own Mischief Managed Shirt. Oh my goodness I love this so much. It's HP nerdy without being over the top. Yay! My husband will love this. Stopping by way of Gingerbread's linkup party.